Whew, has it been a busy day. That seems to be my M.O. recently- I’m always busy doing something. It’s tiring, but I like being on the go. It’s much more exciting than just sitting around! Today I have a gorgeous polish to show you from Essie’s fall 2013 “For the Twill of it” collection. I know I’m a bit late showing these fall polishes, but hey, better late than never, right? I actually used this color recently in my cotton candy water marble, but I’ve never shown it on its own. The Lace is On (the color du jour) is a deep purple/magenta metallic. It’s almost blackened in some light on the nail, which adds a great 3D depth to the manicure. But there’s also some subtle pink shimmer running through the polish, as well. It’s definitely a stunner. Formula wise? Um… definitely not a fan. First of all, the brush seems to be really stiff. 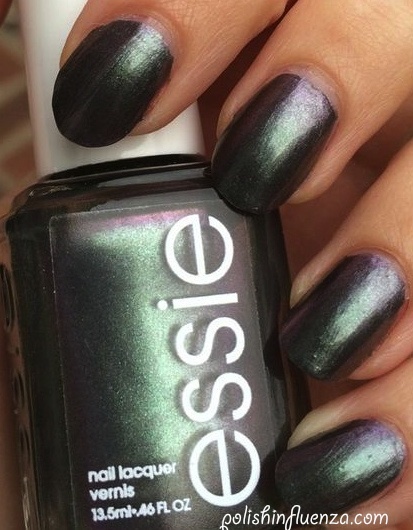 I’ve never had that problem with an Essie polish before, so I have to wonder if it’s just a bad bottle. The polish was also kinda gloopy and hard to apply (which you can tell by my swatch pictures). It’s pretty uneven and kinda patchy, even after the second coat, and it’s so thick I wouldn’t want to apply a 3rd. It’s a shame, because the color itself is such a stunner. Pictures below are 2 coats of The Lace is On, no topcoat. I wanted to hide some of the imperfections of the polish, so I decided to layer a glitter over it. I picked OPI’s Lights of Emerald City, which is a matte white square glitter with iridescent small square glitters interspersed. I’ve reviewed it before, here. I really like the combo. Pictures below are one coat of LOEC over 2 coats of TLIO. I like how the iridescent squares look firey red against the magenta base of the Essie polish. So, I guess all in all, it is a win-manicure today. Have you had the same issues with The Lace is On as I have? Let me know in the comments. Essie polishes retail for between $7-$9 a bottle, and can be found at most drugstores, beauty supply stores, and on their website, here. 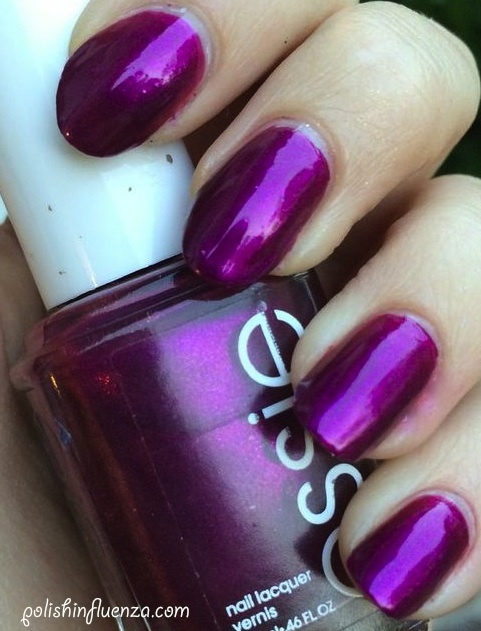 Categories: Essie, OPI, Uncategorized | Tags: Essie, fall 2013, For the Twill of it, glitter, magenta, MOTD, nail polish, OPI, pink, square, the lace is on | Permalink. Friday Fun Nail Art- Cotton Candy Water Marble! It’s Friday, Friday, gotta get down on Friday… sorry for that, I’m just so glad this week is over! SUCH a relief! I hope you all have fun plans for this weekend, I have a 6 hour rehearsal for my school’s fall play tomorrow! Long, but I love the cast, so it’ll be a great time! It’s been awhile since I’ve done nail art, so I decided to get back in the swing of things today and try my hand at a water marble design! I knew I wanted some brighter colors to counteract how gray it has been outside this week, and Essie’s The Lace is On from the fall 2013 “For the Twill of it” collection seemed like a great polish to start with! One of my favorite color combinations of all time is pinks/purples and blues/turquoises, so I decided to pair the beautiful purple sparkle of The Lace is On with Zoya’s Giovanna, which is from their fall 2013 “Satins” collection, and is a deep, rich green-based teal. I decided to mellow out the sparkles of both of those polishes with a minty creme, and Sally Hansen Xtreme Wear’s Mint Creme was the perfect color to complete the trio. I swirled them around in lukewarm tap water and got the design you see below! Pictures below are with NYC’s In a NYC Minute topcoat. What do you think of this color combination? 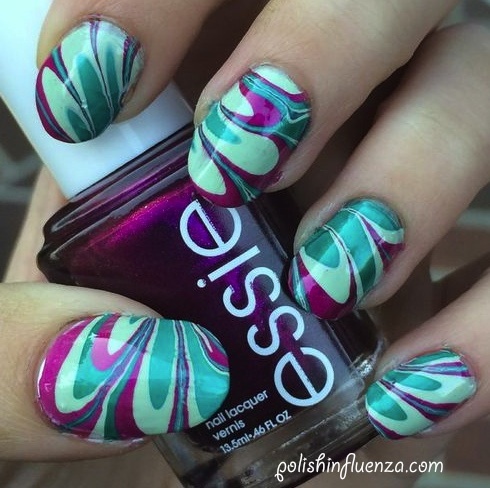 Are you a fan of water marbling? Let me know in the comments below! I love creating nail art like this, it’s easy and fun, and it impresses everyone who sees your nails! If you need an easy show stopper, this is the technique for you! Just make sure you tape your cuticles before dipping your fingers in the water, or you’ll get polish EVERYWHERE! Tape will help reduce the mess. I’m currently taking suggestions- what would you like to see me do for nail art in the future? Please give me feedback so I can give all of you amazing readers what you want. I strive to make this blog enjoyable to a large audience, so don’t hesitate to let me know what I’m doing right and wrong (in a nice way, of course!). Once again (I say this ALL THE TIME), I love you all, and thank you for your continued support! Categories: Essie, Nail Art, Sally Hansen, Zoya | Tags: blue, Essie, fall 2013, For the Twill of it, Giovanna, nail art, nail polish, pink, Sally Hansen, Satins, teal, the lace is on, turquoise, water marble, Zoya | Permalink. HAPPY FRIDAY EVERYONE!!! We did it, we all survived! To celebrate, I have a fantastic polish to share with you today! 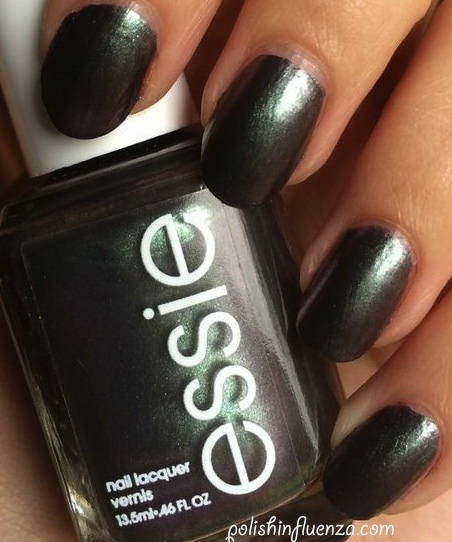 It’s Essie’s For the Twill of it from the Fall 2013 collection. I’ve wanted this polish for FOREVER and I finally buckled down and just decided to get it. I kept telling myself I had sufficient dupes of it (I’ll make sure to have a comparison post later! 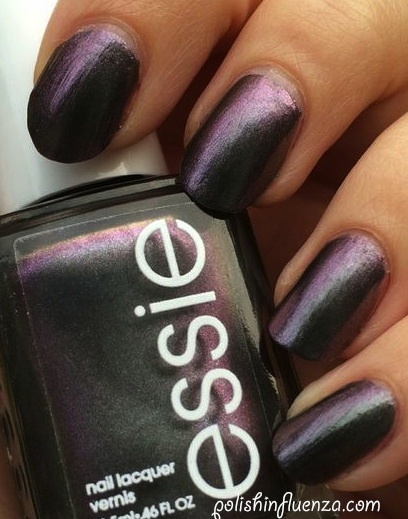 ), but the more I looked at my dupe polishes and FTTOI, the more I realized that I needed this Essie gem in my collection. And now that I have it, I have no regrets! For the Twill of it is a chameleon of a color. It’s purple in the bottle, but deep in a gray way, like the sea right after a storm. It flashes between a teal-green, a pink, and a blue depending on the way the light hits it. I don’t think it’s possible for this polish to ever look quite the same twice because of the extreme duochrome. It’s actually quite opaque, despite the general tendency for polishes like this to be sheer. It’s also pretty thick for a polish like this, though still workable. 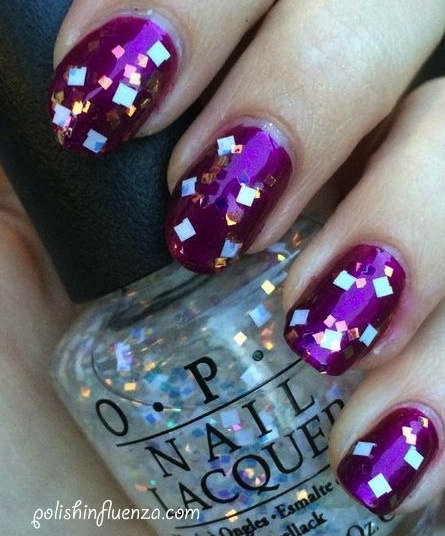 The most common comparison for FTTOI is OPI’s Peace Love and OPI, from the fall 2013 San Francisco collection. I unfortunately do not own this polish, but from what I’ve seen, they’re essentially dead-on dupes. I really love this polish though. I used 2 coats for the pictures below! Sorry that this post is so picture heavy, but it was necessary to show off the multi-faceted color of the polish! So what do you think of this stormy purple gray polish? Are you a fan of the color flashes? Let me know in the comments below! Essie polishes generally retail for between $7-$9 a bottle, and can be found at most drugstores, beauty supply stores, and on their website, here. 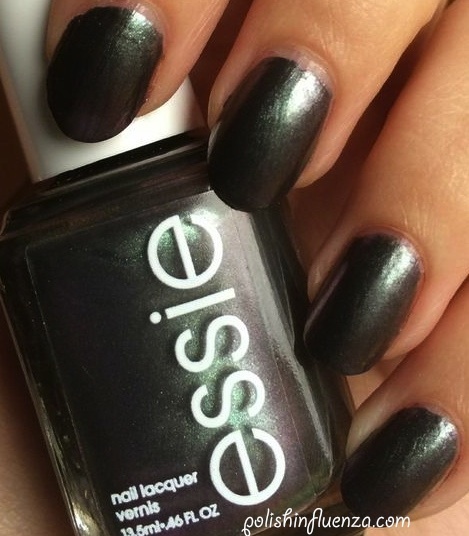 Categories: Essie, MOTD | Tags: duochrome, Essie, fall 2013, For the Twill of it, gray, green, MOTD, nail polish, purple, red, shimmer | Permalink.